Home > Shop By Brand > McKee's 37 Waxes, Compounds, Coatings > McKee's 37 FC-717 Swirl Remover > McKee's 37 FC-717 Swirl Remover 16 oz. Formerly known as McKee’s 37 Fast Compound, McKee’s 37 FC-717 features a new and improved formula that boasts the same great cut and finish, but with no foul odor! Preserve surface gloss while removing noticeable paint defects – it is possible with McKee's 37 FC-717 Swirl Remover. First, do no harm. McKee's 37 FC-717 Swirl Remover works on the principle of doing only what’s required to restore the damaged paint. Precisely milled abrasives – and a lot of them – blend away moderate to severe blemishes without removing significant layers of clear coat. Since clear coats are extremely thin, these Concentrated Micro Abrasives preserve as much of the paint as possible while removing only the defect. McKee's 37 FC-717 Swirl Remover uses diminishing abrasives to remove moderate to severe swirls, moderate scratches, oxidation, water spots, and overspray. Lose the swirls, keep the gloss. Even though McKee's 37 FC-717 Swirl Remover is less abrasive than a traditional compound, it removes the same imperfections: moderate to severe swirls, moderate scratches, oxidation, water spots, and overspray. The abrasives gradually diminish as they work, giving you a built-in finishing polish. The paint will experience little or no loss of surface gloss. In most cases, you will not need to use a separate finishing polish. Keep it real. There are some scratches that can only be removed by a professional. If the scratch extends all the way to the color coat, removing the scratch requires removing the entire clear coat surrounding the scratch. Unless you intend to repaint the vehicle, this is an impractical solution for at-home detailers. McKee's 37 FC-717 Swirl Remover is formulated to remove blemishes without jeopardizing the paint system. It’s a real world approach to at-home paint care. McKee's 37 is dedicated to preserving your vehicle and the environment. 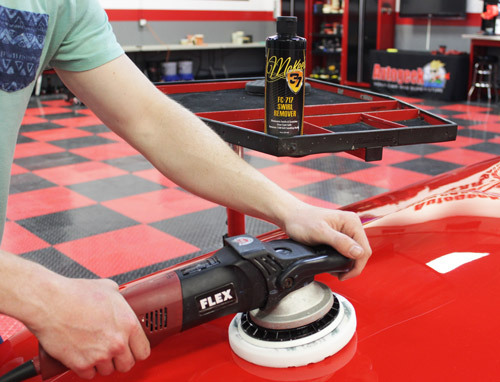 McKee's 37 FC-717 Swirl Remover is VOC compliant, body shop safe, silicone-free, and clear coat safe. Apply McKee's 37 FC-717 Swirl Remover with a light cutting pad on your dual action polisher. Set the maximum speed to 5000 or 5500 OPM. For the easiest application, mist the pad with McKee's 37 Polishing Pad Conditioner before applying the swirl remover. Pour several dime-sized drops of the product onto the pad and spread it onto a section of paint. Turn the polisher on and work the swirl remover into the paint until it begins to turn clear. McKee's 37 FC-717 Swirl Remover contains no fillers so you can see the results of your work. Buff with a microfiber towel. Paint flaws are only skin-deep. Remove moderate imperfections without removing surface gloss with McKee's 37 FC-717 Swirl Remover.